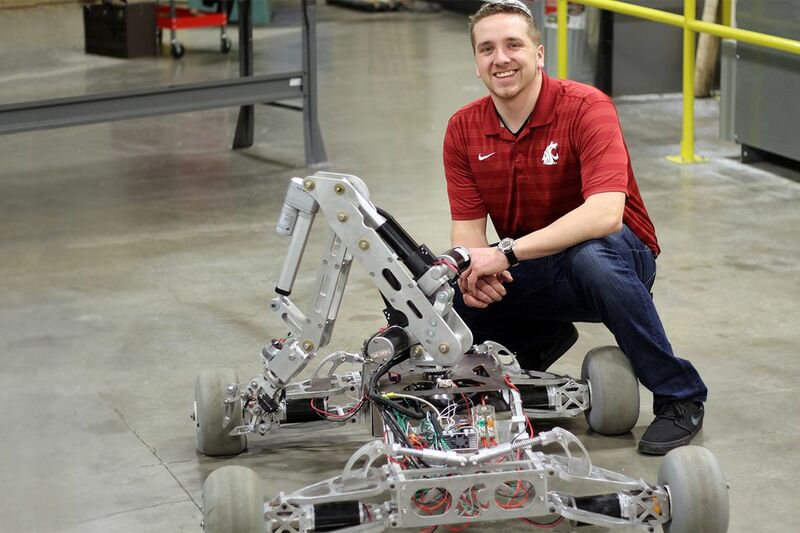 For Blaine Liukko, a new graduate from WSU North Puget Sound at Everett, the journey to Mars goes through Utah. Liukko, a 24-year-old mechanical engineering major from Lynnwood, has been president of the 20-member Engineering Club at Everett for the 2015-2016 academic year. The club has spent more than a year building an experimental prototype Mars rover, a vehicle that will work 34 million miles from Earth and collect data about the red planet and one of our closest neighbor in the solar system. The Mars Desert Research Station is a private proving ground situated far from the public eye, on Cow Dung Road in southern Utah’s rocky, rust-colored barrens. It is open only by appointment, and only to researchers involved in scientific inquiry. That’s where WSU’s fledgling, two-year-old team will compete against 29 teams from seven countries in an event that tests rover maneuverability and dexterity and team scientific knowledge. According to Liukko, the rover is now in its second iteration. It boasts a carbon fiber chassis and arm that are about 30 pounds lighter than the aluminum used in the rover prototype. The team put hundreds of hours into the design, testing and manufacture of the rover, which is undergoing preliminary tests at a track in Arlington before the Utah competition. However well the Rover performs in Utah, members of the Engineering Club will soon enter a workforce with significant demand for their skills. That’s because there is a growing shortage of workers trained in science, technology, engineering and math (STEM) in the North Puget Sound Manufacturing Corridor, which is home to world leaders in aerospace, clean energy, electronics and other high-tech fields. According to the Washington Roundtable, some 25,000 jobs (most in the STEM disciplines) went unfilled in 2013 across the state because of a lack of qualified candidates. But WSU Everett’s next generation of engineers needs to look no farther than just down the road. In Everett, aerospace titan Boeing employs 30,000 people on a campus that’s bigger than Disneyland. The employment prospects for engineers have seldom looked better, according to Alex Pietsch, WSU’s associate vice president of corporate relations. It was Pietsch who created the state’s first strategic plan for developing its aerospace industry and helped shape the winning bid to have Boeing build the 777X in Everett. Boeing’s greatest needs are not in traditional aerospace engineering, but in electrical, computer and mechanical engineering – precisely Liukko’s area of expertise. With June 2 looming, he and other team members are counting the days to when they’ll learn if their rover has what it takes to navigate the hostile, barren landscape of the red planet. Designing and building the Mars rover was expensive and required specific materials. But local industries and WSU have been generous, he said. “It was great to get support from companies like Boeing and Janicki Industries, particularly because some of our team members can and will work there after graduating,” said Liukko. Boeing and Janicki both donated carbon fiber. Everett Steel, Metal Supermarkets and Protocase provided aluminum, brass and stainless steel. To power the rover, Pacific Power Batteries donated a 4.5 pound lithium iron phosphate battery. And Dassault Systemes gave the team software licenses so students could design the rover. The team also received start-up contributions from the WSU Foundation, Voiland College of Engineering and Architecture and the Bruce and Barbara Wollstein Endowment in Engineering.